Bad image, but it’s so true. So onto the cookies shall we? Okay, so first of all I’d like to apologize for not coming out with a chocolate chip cookie recipe sooner. I was so intimidated. All chocolate chip cookies have a ton of butter and a bucket full of sugar. That won’t be happening here, people. Here at Desserts with Benefits, we make nutritious recipes. 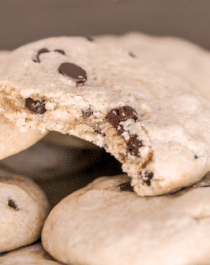 These Healthy Chocolate Chip Cookies are made with whole grains, zero butter, and most importantly, zero sugar! And to make the cookies suitable for everyone I made them eggless. These cookies are soft, buttery and sweet. I’ll take a whole stack of cookies, thank you very much. Healthy Chocolate Chip Cookies? YES! 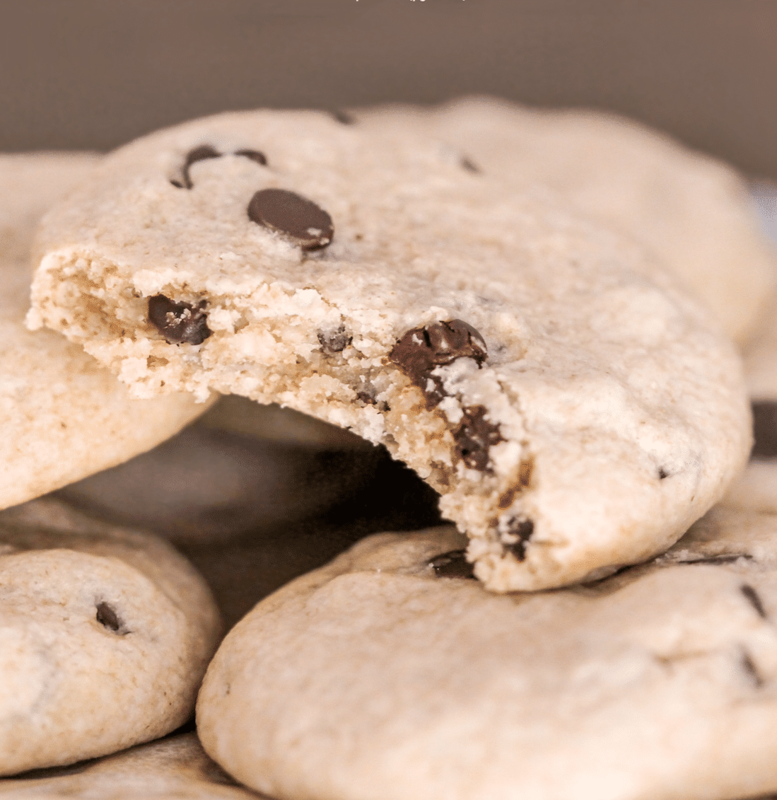 You'd never know these cookies are actually good for you, they taste way too sweet, rich and decadent to be guilt-free! Preheat the oven to 350 degrees Fahrenheit and line 2 cookie sheets with parchment paper. In a medium-sized bowl, whisk together the oat flour, erythritol, baking powder and salt. In a large bowl, whisk together the coconut oil, almond milk, vanilla extract, butter flavor and stevia extract. Dump the dry ingredients over the wet ingredients and fold together with a silicone spatula. Fold in the chocolate chips. Scoop 2 heaping tablespoons of the cookie dough into your palms, roll it into a ball, then gently flatten it into a patty shape. Place the cookie dough patty onto the prepared cookie sheet. Do this with the rest of the cookie dough. Bake for 12 minutes. Slide the parchment paper off the cookie sheets and onto wire cooling racks to cool. Serve immediately, or store in a tightly sealed container at room temperature for up to 3 days. 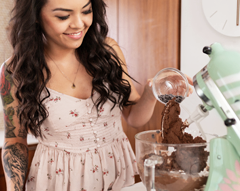 HERE’S A VIDEO SHOWING YOU HOW FAST AND EASY IT IS TO MAKE THESE HEALTHY CHOCOLATE CHIP COOKIES! THANK YOU so much you may have just saved my life! One question though: where do you find butter extract? Oooo good idea! I need to try nuking the cookies to make the chocolate all gooey and warm again, mmmm delicious. These chocolate chunk cookies look amazing! I love how you do the nutrition label comparisons – truly stunning results! I would much rather have a handful of these cookies than any regular chocolate chip cookie. Is there something I can substitute for the Ener-G Egg Replacer? I’m wondering if ground flax and water would work. Or possibly a regular egg? Also, could I use Xylitol in place of the Erythritol in this recipe? This is so healthy! I loved the fact that these are guilt free. Wonderful cookies! Great job, Jessica! These look great! I like that they don’t look super gooey or messy – so they’d be perfect for me to take to work. 🙂 I also love Enjoy Life chocolate chunks too! They are amazing!! This is a fantastic site. I am going to try the recipes. Thank you for such amazing/healthier yummy ideas! Jessica- Is there any other options for soy milk? These cookies look awesome, and I want to make them, however I’m new to the egg replacer. Is there some amount of water I need to mix with the replacer and let gel like a flax egg, or is it really just the amount of the powder in the recipe? Thanks! Pingback: Needs Salt » swooning over. 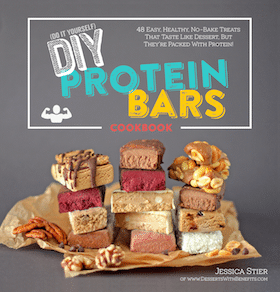 Do you think I can use brown rice protein powder in place of the brown rice flour? Hmmm, I haven’t tried it so I’m not sure. You can give it a shot though! You might need extra protein powder to thicken up the dough, or you might need extra coconut oil or milk to help get the mixture into a dough. thank you for the recipe. i blended in a can of chick peas, 2 tbs of chia seeds, and another 1/4 of almond milk. my kids (1.5 and 2.5) loved these cookies. the 2.5 year old mostly only wants sweets so i found your website about a week ago and try to make something healthier for her. I’m actually pretty sure it was the egg beaters now… We made chili for dinner and I made cornbread and since I was still out of real eggs I used it. Came out dense like pancakes. No matter how much you whip them they just don’t fluff like the real thing. Real eggs for baking from now on! I will try the ener g egg replacer soon too. Oh yeah, good point! I’ve never had much success with baking with liquid egg whites. I feel like they cook well for scrambled eggs but NEVER desserts! If you don’t want to by the egg replacer maybe you can try using a whole egg instead. It’s a bit easier but I’ve read that eggs make for a cakier cookie. I Tried these today, Came out really well. Used flax seeds instead of egg replacer! Thats all! And they were a HIT! Thank you! Theres so much more a gotta try. I make one of your recipes each day for past week or more. I am so glad i came across your blog. Have a great dessert-filled week! Can’t wait to try these 🙂 One question – Can I use apple cider instead of Baking Powder? 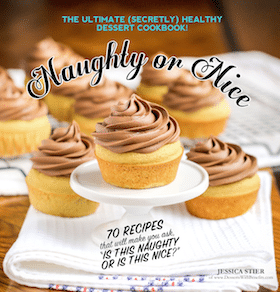 I just bought your Naughty or Nice cookbook and love it! I had a question about the coconut oil used in this recipe and a couple others. It says coconut oil, liquid. Does this mean you have to use the actual liquid coconut oil (like it as packaged as a liquid)? Or can I use the solid coconut oil and just melt it into a liquid before mixing it in to the recipe?